It’s no secret that tons of indie developers want to cash in on that good old 8-bit nostalgia. Many try to capture the magic of the classics, but very few are able to replicate it. For every good game it seems like there’s at least 10 bad ones. The question then becomes: how does Awesome Pea fare in this oversaturated field of throwback games? The answer is that most gamers will find much left to be desired. This game is your average action platformer. You run and jump through the levels trying to avoid traps and enemies that can kill you in one hit. The developers put an emphasis on its difficulty while attempting to appeal to the speed running audience. This strategy works with games like Super Meat Boy, but the charm and brilliant design found there is completely missing in Awesome Pea. The biggest problem is that the levels are so bland that replaying them over and over feels like a chore. This is a death knell for titles like this where the player is supposed to want to replay the stages again and again. There’s a severe lack of creativity in this game that absolutely kills the experience. It plays like thousands of other uninspired platformers. Absent are unique controls and fun gameplay elements to make it stand out. It feels like a chore to play this game and the fact that the levels are designed to antagonize you does not help its case. The lack of passion found throughout is so apparent that you could swear this game was created by a generic algorithm that somehow meshed together the boring parts to create a largely generic experience with little to no redeeming qualities. Awesome Pea boasts how it was inspired by classic Game Boy games, and at first glance, it might seem that way. But after a closer look, you can see that it is nothing but a cheap ploy to cash in on nostalgia. I’m sorry, but simply emulating the color scheme of a classic Game Boy doesn’t give you a Get Out of Jail Free card for everything else. They couldn’t even get this aspect 100% right – offering up a CRT filter, because you know, Game Boy game totally had that option, right? Other problems, like the soundtrack sounding way too good (quality wise – not composition wise) to be on a Game Boy and plain Jane gameplay makes this one easy to forget. And you probably should. Despite the game’s difficulty, it is a rather short game that could be completed in under an hour if you’re skilled enough. The game has a total of 30 levels, so the game banks on its challenge to make it seem much longer than it actually is. This wouldn’t be so bad if the game had some good replayability to it, but if you wouldn’t want to play a level once why would you want to go through it again? Even putting aside the bland level designs, the frustrating traps and level restarts really ruin any chance of you wanting to play through the game a second time. Now that you’ve read this review you shouldn’t have that problem! 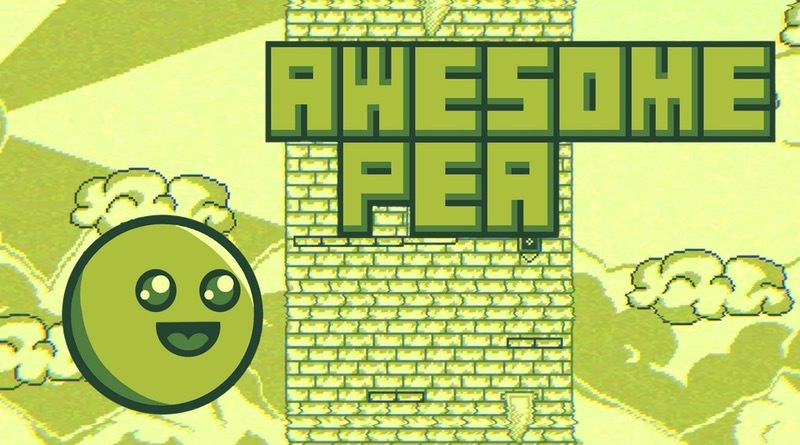 Awesome Pea is an action-platformer that lacks any form of passion. Zero creativity, poor music, and forgettable level designs make this one an easy “NO” for most gamers.